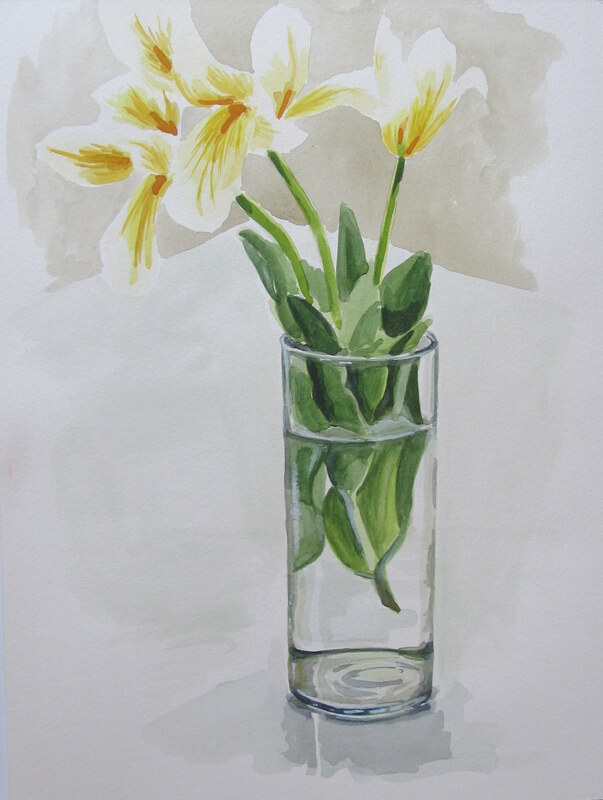 Watercolour Wednesday — Bedraggled tulips in the studio. After finishing the acrylic painting I did of these tulips (see the previous post here), they were still going strong so I decided to take them to the downtown studio on Sunday. However, the very warm day and very warm drive over to the studio proved to be a bit too much for them. By the time I got there the tulips looked ready to fall apart, but I decided to paint them anyway since they had very beautiful form in their bedraggled state. The funny thing is that now that they are back home they are once again standing up, and the dark orange veins that had appeared have lightened back to yellow. Fascinating. Hi Dayna, I really like this painting you did in the studio. It looks so soft and zen like. I hope to see more of them!